Carlson's Flooring America | MGS Designz & More! 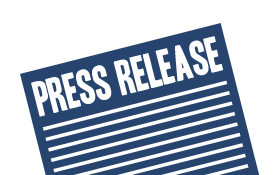 Carlson’s Flooring America Grand Opening! A SPECIAL INVITATION JUST FOR YOU! COME JOIN THE FUN! Carlson’s Flooring America in Fort Myers is happy to announce its Grand Re-Opening party on Thursday March 24th from 4 to 9 pm. The Carlson’s are excited to show off their beautiful, newly renovated and expanded showroom. Guests will enjoy a fun evening of drinks, appetizers, door prizes, and awesome giveaways! 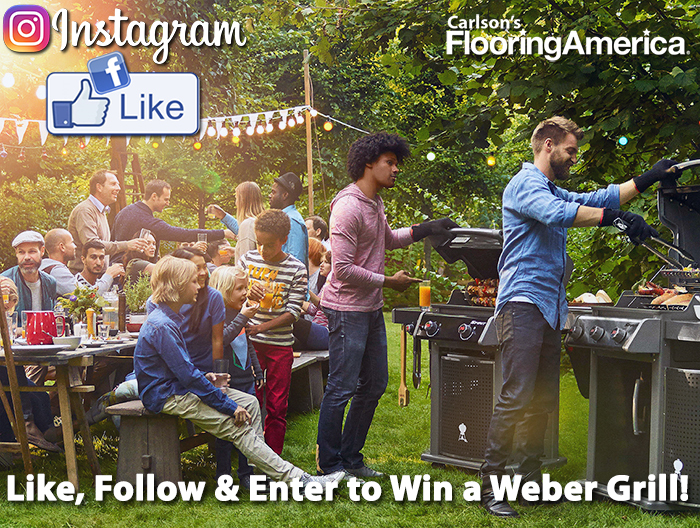 In celebration of this exciting and fun event Carlson’s Flooring America is offering Up To 50% OFF Savings on Carpet, Porcelain Tile, LVT, Wood, Laminate, and Labor performed by their Certified Installers! Previous customers receive 10% OFF any product as a Thank You for their preference and loyalty. This is a FREE event that is open to the public and great for the whole family. 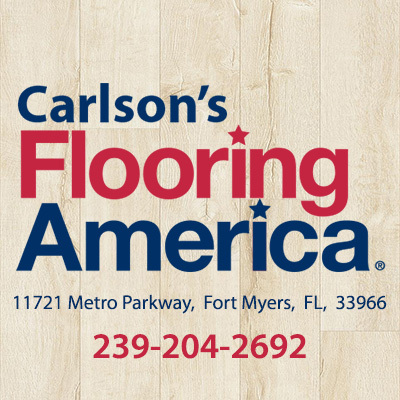 Carlson’s Flooring America is located at 11721 Metro Parkway, Fort Myers, FL 33966. 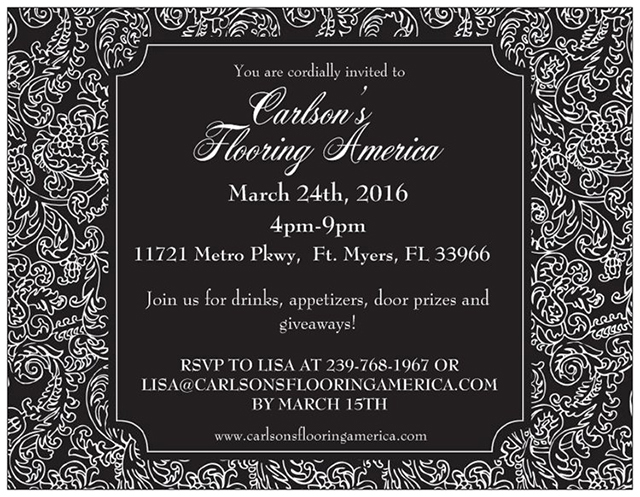 Please feel free to RSVP to Lisa at 239-768-1967 or email her at lisa@carlsonsflooringamerica.com. RSVP is welcome but not required to attend. MGS Designz & More is dedicated to growing your business and getting you noticed! FREE EVENT WITH REFRESHMENTS, PRIZES AND GIVEAWAYS! 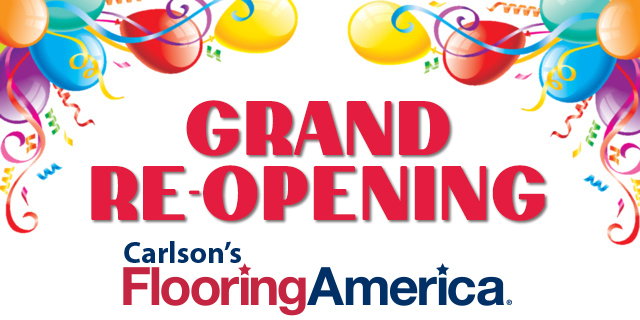 Fort Myers, FL – (March 10, 2016) Carlson’s Flooring America in Fort Myers is happy to announce its Grand Re-Opening party on Thursday March 24th from 4 to 9 pm. The Carlson’s are excited to show off their beautiful, newly renovated and expanded showroom. Guests will enjoy a fun evening of drinks, appetizers, door prizes, and awesome giveaways! Carlson’s Flooring America has been proudly serving the Southwest Florida area since 1977 and is a 4th generation family owned and operated local business. With almost 40 years in Florida, their certified sales staff has over 4 generations of flooring knowledge to best service their customers. 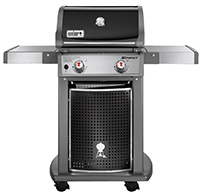 Their CFI Certified Installers are second to none and always strive to do the best job possible. With the industries best pricing and longest warranties, Carlson’s Flooring America is a one stop shop for all your flooring materials and installation! As part of America’s leading flooring retail group, and the world’s largest co-op – Flooring America, our 500-store plus nationwide buying power guarantees you low prices on thousands of carpet types and other flooring options backed by the most solid warranties in the floor covering industry. Carlson’s Flooring America is more than just a flooring specialty store. We are experts trained in flooring sales and design and will help you find the perfect floor for the way you live. 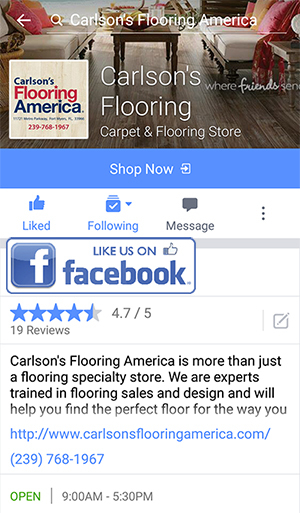 Carlson’s Flooring America is located at 11721 Metro Parkway, Fort Myers, FL 33966. 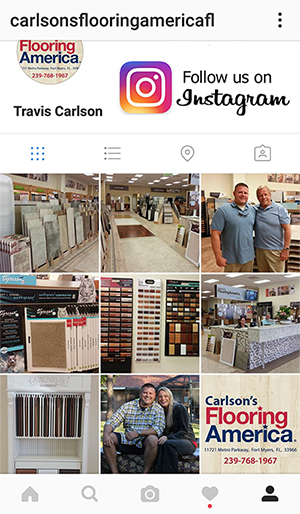 Travis Carlson or Lisa Glass can be reached at (239) 768-1967 or via email atlisa@carlsonsflooringamerica.com and their website ishttp://www.carlsonsflooringamerica.com. 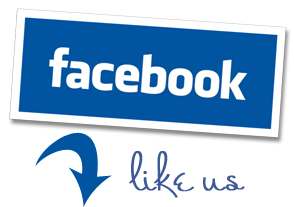 You can also connect with them on Facebook, Twitter, Google+ and Linkedin.